To get yourself prepared for the superhero insanity about to hit theaters on March 25, you may want to check out some movies like Batman VS Superman: Dawn of Justice. I always like to get pumped up before a new movie that I am especially excited about, and there is SO much anticipation already for this movie. With Batman VS Superman: Dawn of Justice there are many good movies out there that can help you remember (or catch up on!) all the nitty gritty details of these superhero stories. What’s that green stuff that makes Superman scream? Why is Batman so brooding and angry? Learn all of the backstory with movies like Batman VS Superman: Dawn of Justice. Batman VS Superman: Dawn of Justice is already slated to be a smash hit, and you may want to pump yourself up. If you have been living under a rock (don’t worry, we’ll catch you up!) Batman VS Superman: Dawn of Justice is an EPIC superhero movie that is due to hit theaters March 25, 2016. The movie stars Ben Affleck as Bruce Wayne/Batman, Henry Cavill as Clark Kent/Superman, Amy Adams as Lois Lane and Jesse Eisenberg as Lex Luthor. Other major superheroes who have never made it to the big screen (ahhhh Wonder Woman!) are also making a major appearance in this movie. Here’s the trailer just because, it’s awesome! 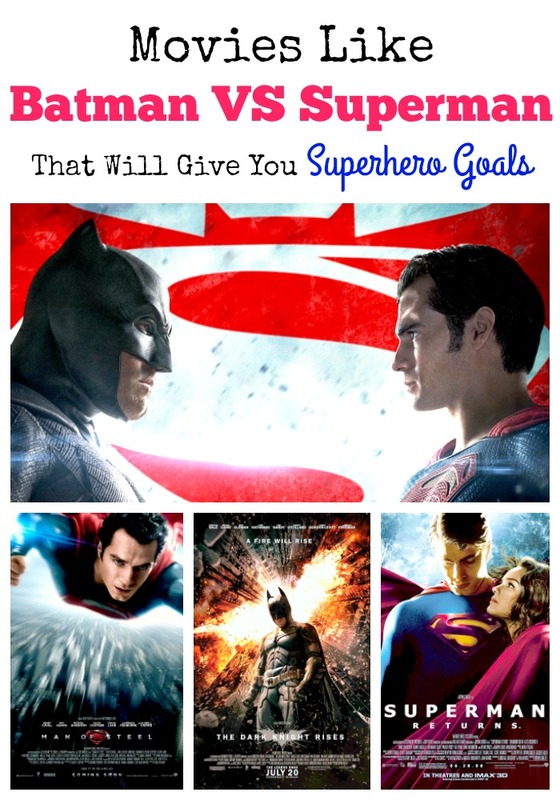 So now that you are ready, here are some other movies like Batman VS Superman: Dawn of Justice. All of these movies should make it onto your screen soon! Man of Steel is a 2013 action superhero movie that is based on the character of Superman by DC Comics. The movie tells the original story of Superman, from his discovery that he is from the planet Krypton to stopping General Zod from destroying humanity. Man of Steel stars Henry Cavill, Amy Adams, Michael Shannon, Kevin Costner, Russell Crowe, Diane Lane and Laurence Fishburne. This is the one to catch up on if you want to know all the nitty-gritty details of Superman’s past. Superman Returns is a 2006 superhero movie that is based on the character Superman by DC Comics. The movie is an homage sequel to the 1978 movie Superman and the 1980 movie Superman II. It tells the story of Superman’s return to Earth after being away for five years, only to discover that his love had moved on, and his enemy was planning to destroy the world. Superman Returns stars Brandon Routh, Kate Bosworth, Kevin Spacey, Parker Posey, James Marsden and Frank Langella. Batman Forever is a 1995 superhero film based on the character Batman from DC Comics. It is the 3rd movie in the Batman movie series, with the other two being the 1989 movie Batman and the 1992 movie Batman Returns. The movie focuses on the story of Batman and his attempt to stop the Riddler and Two-Face to use the citizens of Gotham City to find out who Batman really is and to have the citizens under their control. Batman Forever stars Val Kilmer, Tommy Lee Jones, Jim Carrey, Nicole Kidman and Chris O’Donnell. This is the movie that made me into a Batman fan. I loved the combination of cheese, and how it plays against a brooding Batman. Watch this one when you want to laugh! The Dark Knight Rises is a 2012 superhero film featuring the character Batman from DC Comics. It is the last movie in the Batman film series, with the other two being the 2005 movie Batman Begins and the 2008 movie The Dark Knight. The Dark Knight Rises stars Christian Bale, Michael Caine, Gary Oldman, Morgan Freeman, Selina Kyle and Tom Hardy. Batman is forced out of his exile (that he self-imposed) in this movie, as a guerrilla terrorist names Bane threatens Gotham City. Watch this movie to see a much darker side of Batman. So which of these movies like Batman VS Superman: Dawn of Justice are you going to watch first? I need to rewatch them all!